Mathematic breakthroughs in the 10th and 11th centuries in Baghdad and, for instance, Esfahan may have resulted during the 15th century in an explosion of Islamic Art and Architecture. In particular the use of so called girih tiles, that is a set of polygonal prototiles with well-defined decorating lines may have allowed medieval artists in Iran and Central Asia to create decagonal tessellations with, in few cases, Penrose-similar patterns. Between the mid-14th and early 16th centuries, the Timurids ruled over much of the Islamic world. The highly sophisticated and strictly geometric (‘Islamic’) patterns on glazed tiles covering buildings and monuments became later more and more floral. Exquisite examples of this changing style can be seen in Esfahan’s Grand Mosque and Darb-i Imam, Mashhad’s Gohar Shad mosque, or the Friday Mosque in Yazd. The Timurids were repelled in Iran by the rulers of the Safavid dynasty (1501–1736 CE) who established the Shi’a branch of Islam as state religion. Many historians regard specific achievements during these centuries as the true apogee in Islamic Art and Architecture. One marvelous example is the Naqsh-e Jahan in Esfahan. Geometric, calligraphic and floral designs cover both religious and secular buildings while ancient roots of the Iranian society, in particular the Achaemenid style of intricately carved wooden ceilings and slender pillars are well preserved in certain palaces, reminding of the grandeur of ancient Persepolis. Another area where the specific designs of the Safavid period can still be studied is few surviving carpets of that time. 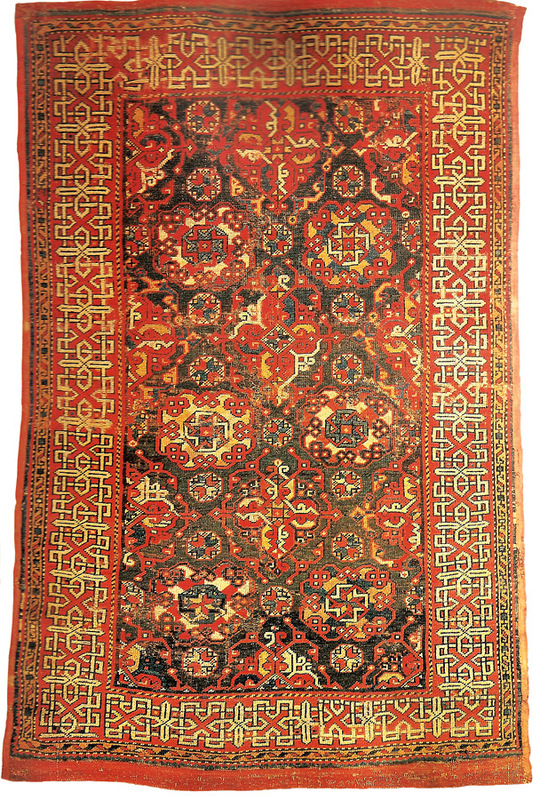 Two years ago, Christie’s Auction House has sold an Esfahani silk carpet of about 1600 for an, at that time, record amount of $4,450,500. I was wondering at that time, how many of these inalienable carpets are still hoarded by wealthy Tehran bazaaris in their vast storages. Well, some of these masterpieces have only survived in paintings of the European Renaissance period (14th to 16th centuries). Famous examples include paintings of Hans Holbein the Younger (ca. 1498-1543) and Lorenzo Lotto (1480-1556). Saudiaramco World has dedicated an article in its recent issue to “Threads on Canvas”, i.e., mainly Anatolian carpets displayed on famous Renaissance paintings (by Tom Verde). Some of the carpet designs are even called after Holbein, and others may have been identified on still existing pieces. 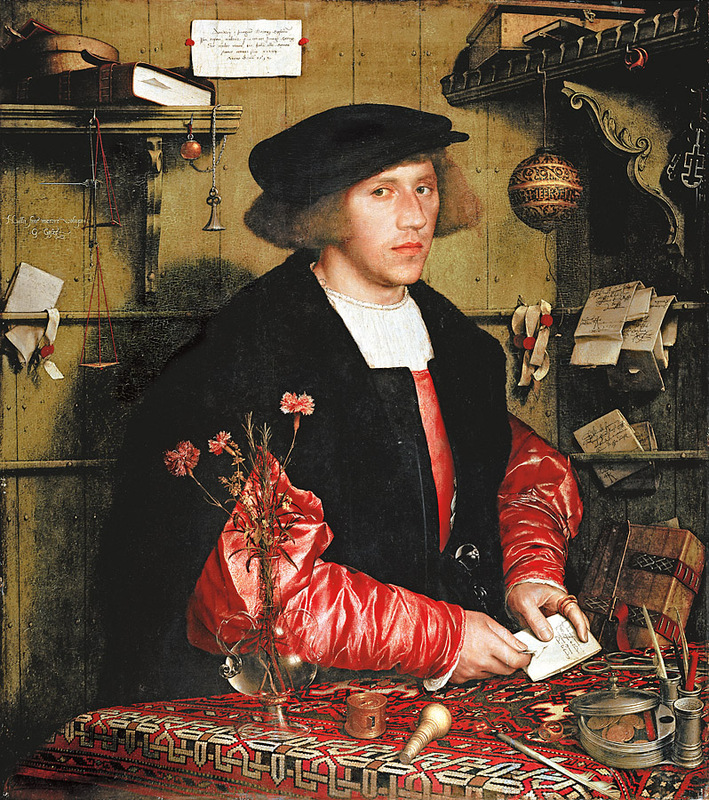 In particular Holbein’s portrait of merchant Georg Giese, or Gisze as the painting was entitled by the artist, (1532) is a fascinating masterpiece illustrating much of the life circumstances of the confident young man, for example his engagement (the carnations in a fragile vase placed too close to the edge of the table) and wealth, symbolized by the carpet on the table. The strapwork border and even the design of the central field can actually be seen in an Anatolian carpet in the Philadelphia Museum of Art. 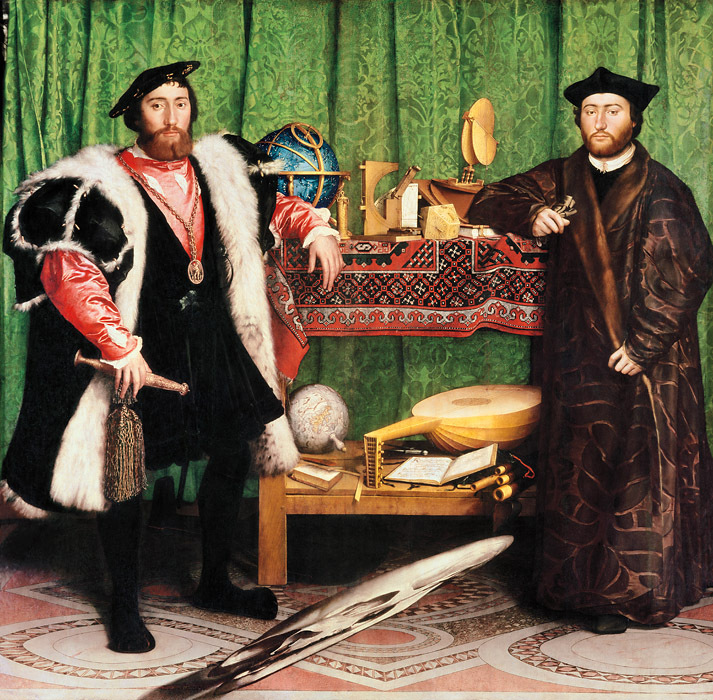 Another example by Holbein is the famous Ambassadors (1533) which may strike the viewer by its surrealistic anamorphic skull in the lower third of the painting, which is only discernible as such when the picture is viewed at an acute angle. It is what nowadays would be called a gimmick, both to shock, or at least surprise, the viewer and impress him or her for the superior mastering of the complicated technique. 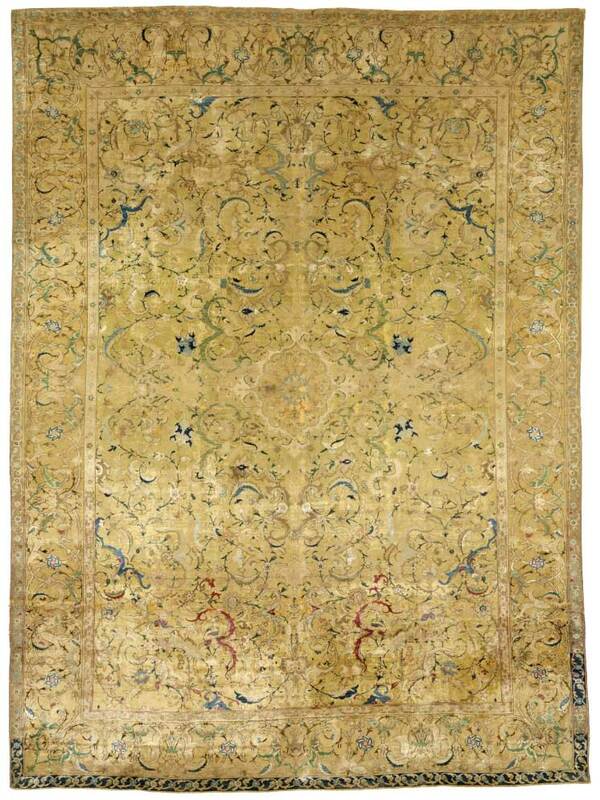 Again, the table is covered by an Anatolian carpet with a ‘large-pattern Holbein’ design. A similar existing example can be found in the Museum für Islamische Kunst in Berlin, Germany. More about carpets of the Ottoman era in general and Holbein carpets in particular may be found here. This entry was posted in Art and tagged carpets, Hans Holbein the Younger, Lorenzo Lotto, Ottoman Empire, Safavid dynasty, Timurid period. Bookmark the permalink.